I came across Marika's work a few months ago on Instagram. Her images kept showing up on my Explore page and each time I'd visit her feed and dot her gallery with a few likes. Marika struck me as a thinker. Her ceramic work and patterns made me curious as to what story she is trying to tell. I knew there had to be more than just patterns and chalky ceramic textures. Marika's artist statement is dense with the plight, her search for identity and connecting personal history through her work. Her pioneering along this introspective fantastic voyage is what makes her a Narratorial Creator. Marika Yeo is a visual artist who primarily works in ceramics. Her sculptural and functional pieces draw from patterns and forms related to her cultural background. Marika stepped into the world of visual arts at a young age and has gone on to complete her BFA with a major in ceramics. Her conceptual work often has its roots in ideas related to the theory of the Third Space, which rests on the notion that there is validity in thinking about the complexity that occurs beyond dichotomies -- in the space where cultures meet. "laughter is a spiritual relaxation"
Marika, I read your artist statement several times and I found that, essentially, your work is analogous to Journeying Soulfully. Needless to say I am very grateful to hear your insights on your work and how it’s lent you insights about the journey. In the beginning of your artist statement you say “The act of seeking out traces of things left behind and searching for an understanding in uncertainty is fundamental to my practice.” Can you unpack this some more? Yes absolutely. that could be applied to various aspects of living and across cultures and circumstances. But for me personally, there is a lot regarding my culture and background which I don’t know much about. family who have chosen not to be present in my life. I think there is a great power in using “art as a way of knowing”. When I am creating, I feel as if I am searching and piecing together parts of myself that can only be known in this way. What’s been the most dynamic discovery about your identity thus far? There are certain ways of “making” that I used when I felt really in the flow of the process. It was to do with a particular way of shaping clay into a vase. was actually used in a specific region of the world where it's believed my ancestors had come from. This made me think that we're all connected...and that somehow we are also connected with the knowledge of the past. I think we stay connected with our ancestors and it influences us. What have you learned about yourself, human nature as you search for “understanding in uncertainty” with your work? I think I have learned a few things. One of them is learning to be comfortable with ambiguity. is common so just learning to be ok with that has been a practice for me. What inspires you about uncertainty? Do you believe uncertainty plays a beneficial role along the journey? How? forgetting our fears and self-imposed limitations. Again, back to your artist statement, you say: “As I seek to understand the coming together of these layers and pieces, I also intend to emphasize the ambiguity that is created with the spaces and cracks left in-between.” Do you think this is a reality that extends into our lives as well? Yes for sure. I actually think at that point in my statement I wasn’t even really referring to my art anymore. I originally wrote this statement for a gallery show I had about two years ago where I created sculptural pieces to speak about space in-between cultures. I wanted to challenge myself and the audience to think about the ambiguity in our lives. For me, there are a lot of “spaces” in my identity. Things I don’t know and things I will probably never know about my family, culture and history. I am someone who has both African/Caribbean and European/Canadian history and this type of coming together of culture and identity is ever more increasing in our global present in various ways. For the longest time I tried to fit myself into certain categories. I saw how easily other people defined their identity but it didn’t come that easily to me -- particularly because I have so many questions about my background and culture that are unanswered. But I think that sometimes we just need to accept that we are on a journey of search and search is often characterized by a certain level of uncertainty and ambiguity in my opinion. Can you talk about the metaphorical commonality between working with clay from block to kiln and the journey of life? Whether artists or non-artists, what are some practices you believe teastained women can take up to understand their background’s spiritual/emotional/metaphorical layers and use them to move forward? One practice that has been helpful for me is to avoid dichotomizing my life. I moved past trying to “define” certain aspects of my being particularly related to race and culture. I think finding that thing that brings you joy or makes you feel at peace and doing that is good. While you’re doing it I found it helpful to pay attention to the thoughts and feelings I’m having. I mean I don’t know much but I do know that when you’re in that space it can be pretty meditative and I am often surprised at what comes through to me during those times. Do you encounter fear when you’re working? What triggers it? How/where does it manifest and does it fuel or hinder your work? I definitely do. All the time! I can’t even count the number of times I have encountered fear…it would be impossible! I think fear in my situation is often triggered by my ego. Fear of things “going wrong,” or “someone not liking it,” are common. from that invisible place into this physical reality. I could see it in my head but had no idea how to do it. versus doing it out of love for creating regardless of the outcome. "These little dishes remind me of stepping stones for some reason...and the quote 'turn stumbling blocks into stepping stones'...how do you turn stumbling blocks into stepping stones?" the feeling that seems to predict defeat before we’ve had the chance to step out as overcomers? I try to think of fear as something outside of myself. Like a visitor. Or a giant grey cloud haha! I look at the grey cloud visitor and just acknowledge that it is there but try not to let the fear become a part of me. I try to think I am feeling a bit of fear about xyz but I won’t let it stop me from doing what I need to do. and how people perceive me and more about what I can offer to others. I’m just trying to give something to the world and the fear of failure isn’t as pronounced. people will perceive me or what will happen if I fail. It just helps to shift the focus. could see the Sun itself in every atom." What’s your internal dialogue when you’re doing something new with any of your mediums? It is usually just me feeling excited to try something new. Recently I had this inspiration to add gold leaf to both my paintings and ceramics. I’m pretty excited about this. I usually get really into an idea and then the first time I try it, it totally fails. Like I can absolutely say that my life works in these cycles of crisis and victories, sorrow and joy, and periods of tests and ease. So this includes my art practice. I know that my practice works in these cycles so I try not to get too attached to all my crazy new ideas for this reason. How long did it take you to recognize your “cycles” and has being aware of them made you a better woman beyond the studio? How? I think I became most aware of these cycles when I was young and participated in something called the Spiritual Empowerment Program through the Baha'i Community. It really got me to critically think about the world and my role in it. I also felt like we looked at the world in a scientific manner...we analyzed it and looked at patterns. Looking at the patterns in my own life and in the world I could see that almost all things go through crisis and victories. Beyond that we looked at the processes of integration and disintegration that are happening in the world...how systems and structures may be disintegrating (which can be frightening at times) but there's also many beautiful processes of integration happening simultaneously that are bringing people together. Through this I've learned that your self development and the development of world aren't two dichotomous things. I feel they need to happen simultaneously. So I think generally all these things have influenced my life both in the studio and outside of it. "That your faith be as steadfast as a rock that no earthly storms can move, that nothing can disturb, and that it endure through all things..."
Can you talk about your experimentations in watercolour? What appeals to you about watercolour and do you feel/encounter anything different by working with it than you experience with ceramics? I love both watercolour and ceramics for different reasons. Ceramics is very grounding for me. That feeling of clay in your hands is addictive. You literally are moulding whatever you want and whatever you can imagine into three dimensional form with this substance that has come from the earth. How amazing is that!? I think it is anyways haha! Ceramics can also be very frustrating though. It is a process with no quick results and so many things can go wrong along the way. It has definitely helped me learn about detachment and patience. I think at this juncture in time I would probably say ceramics is my true love. There is nothing like opening a kiln and seeing this finished hardened object that you molded with your hands. Watercolour is a bit more relaxed for me. I’ve been painting with various mediums since I was about two years old so it kind of feels like second nature. It definitely isn’t as challenging for me as a medium but I enjoy the ease in which I can explore patterns. 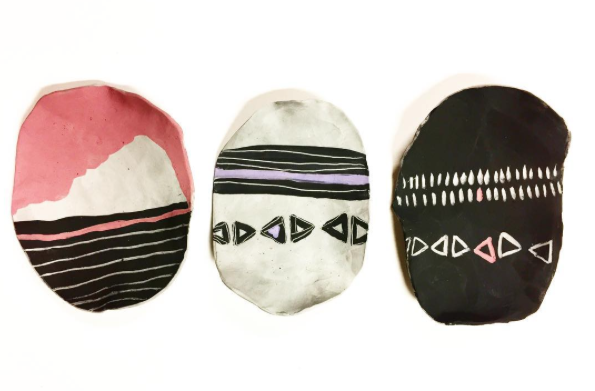 Creating patterns whether on clay or paper is a meditative process for me. Day! I think I’m a grandma at heart. I love going to bed early. I get inspiration randomly. Usually when I’m relaxed. Often when I’m listening to music. you see something you like or want to try to produce. Do you listen to music when you work? If so, what is music’s role in your practice? What’s on your playlist? Yes music is a must for me. It helps me feel relaxed and when I’m relaxed; that is when the ideas and inspiration come through. I notice it is like turning off a creative tap. I just can’t access it even if I try. Sometimes I feel totally chill and want to put on some Bon Iver. Other times I feel a bit more energized and listen to artists like Chance the Rapper. I’m all over the place with music. (and then I ask for suggestions because I love new music!). Do you keep a journal or any other form of self-documentation? Why or why not? Yes I do keep a journal. I don’t write in it consistently although I bet if I did it would be very helpful for my head and heart. I think there is a power in writing things down. I don’t fully understand it but I know there is something special there. Who were you as an artist 3 years ago and what were some key decisions you made that have transformed you to produce your current work? Three years ago I was finishing my BFA in ceramics. to move into discussing the intricacies existing in the spaces of the “in-between”. One of the biggest things I learned was to trust myself and my process. confidence and trust in yourself is needed to move forward assuredly down your path. you are working in while trusting yourself and your intuition. What is it you want someone to walk away with after they’ve encountered your work? My hope is to contribute to the discourses we are having in society around race and culture. I’m not sure if there is one thing in particular I want people to take away from my work but I would hope that people can engage with it in whatever way feels best for them. At the end of the day, I hope the subjects I’m touching on in my conceptual work bring people closer to unity and farther away from dichotomous ways of thinking (that tend to lead to subtle prejudices in our actions and thoughts). or follow her on Instagram!